Are you a Brotherband Chronicles fanatic? You’re in luck. 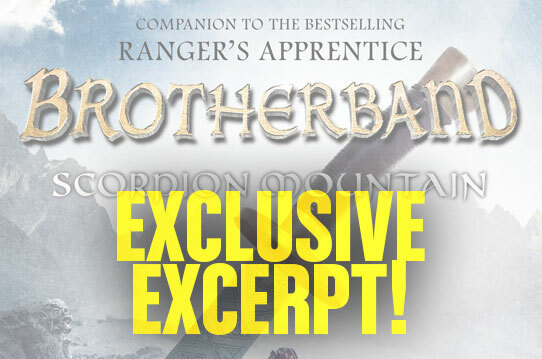 We’ve got an exclusive excerpt from Scorpion Mountain, the fifth book in John Flanagan’s Brotherband Chronicles series. Scorpion Mountain follows Hal, his Brotherband crew, and the Ranger Gilan after freeing the twelve Araluens sold into slavery. Returning to Araluen, Gilan is given a new mission by King Duncan: protect his daughter’s life. Princess Cassandra has survived one attempt on her life already, and now whispers of a second attempt have reached the kingdom. A deadly sect known as the Scorpion Cult is thought to be behind the assassination threat. Not waiting to see if the knife will strike true, the Brotherband again team up with Gilan to track down the would-be killers. In the fifth book in the Brotherband Chronicles series, old friends reemerge to take on new enemies as the worlds of Ranger’s Apprentice and Brotherband join forces in battle! Scroll down to read the first two chapters of Scorpion Mountain. Tom was a plow horse, well past middle age and resigned, like most of his placid breed, to the constant task of plodding up and down, hauling a plow that carved consecutive furrows in the rich earth of Halder farm. He wasn’t accustomed to being stopped in mid-furrow and he turned his shaggy head to look at his owner, Devon Halder. Devon, like his horse, was well past middle age. And the smock that he was wearing was liberally daubed with patches of drying mud. Later that night, when he was asked in the local tavern what led him to stop and and turn around, he couldn’t really recall. Perhaps he had heard the slight sounds of creaking leather and rope, or the rustle of a sail in the brisk wind. The days when Skandians used to raid the coastal and river villages of Araluen were well in the past now. And besides, on sec­ond glance, this was no wolfship. Whatever it was, it was enough for Devon to halt Tom and turn to face the river behind him. When he did, the sight that met his eyes sent a sudden jolt of panic through him. Barely forty meters away, gliding smoothly up the river, was a ship. His first thought was that she was a wolfship, and Devon was old enough to remember when the sight of a Skandian wolfship on the river was a prelude to a sudden, savage attack. He tensed his muscles to run and spread the alarm in the nearby village. But he paused at the last second. She was similar in style and shape, sure enough. She was slim waisted and had a look of speed about her. She didn’t have the broad, capacious lines of a cargo hull. But there was no large square sail such as a wolfship would use. Instead, this ship was rigged with a triangular sail that was mounted fore and aft along the line of the ship, supported by a long, gracefully curving spar that swept up high above the hull. She was smaller than a wolfship. Also, at her bow post, there was no carved wolf ’s head, with raised hackles and snarling teeth. Instead, there was a carving in the shape of a bird’s head. And there was a motif of a seabird in flight on the sail—a graceful bird with wings spread wide. A heron, Devon realized. But the four circular wood-and-metal-reinforced shields ar­rayed down the starboard bulwark were unmistakably Skandian in design, although he noticed that a fifth shield, set level with the helmsman’s position, was shaped like a triangle. The crew, those he could see, were dressed in Skandian fash­ion—with leather and sheepskin vests and leggings held secure by crisscross bindings. Yet he saw none of the horned helmets for which the Skandian sea wolves were well known, the sight of which would strike fear into any honest farmer’s heart. Instead, several of them wore dark woolen watch caps, rolled down to cover their ears against the cold. Devon returned the wave cautiously— his suspicions were still raised. As he watched, the figure at the helm raised a hand in greeting. Devon shaded his eyes to look more closely at the helmsman. He appeared to be quite young, and relatively slim for a Skandian. The person beside him was more like a typical sea wolf, Devon thought. He was bulky, with wild gray hair blowing in the wind. As Devon watched, he realized that the second man had a wooden hook in place of his right hand. Definitely a sea wolf type, he thought. But then the man made a similar gesture of greeting. Devon returned the wave cautiously— his suspicions were still raised. Small as she might be, this was definitely a cruiser, a raiding ship. She was fast, lean hulled and potentially dangerous. And, as the shields arrayed down her bul­wark attested, her crew were fighting men. He watched her closely as she sailed past, gradually pulling out into the center of the river to round the approaching bend. The helmsman and his companion lowered their hands and seemed to lose interest in the elderly farmer and his plow horse. Thorn nodded, scratching his rump with the blunt end of his wooden hook. “He was a graybeard. He’d remember the times when the sight of a Skandian ship meant a raid. I’m surprised he didn’t go pelting off to raise the alarm when he saw us.” Thorn had no idea how close the farmer had come to doing just that. As they rounded the bend and the farmer and his horse disap­peared from sight, Kloof planted her forepaws onto the starboard bulwark and gave out a single bark. Then, content that she had asserted her superiority over all things Araluen, she dropped back to the deck, slid her front feet and flumped down onto the planks. For a few seconds, she watched Hal out of one eye, then she sighed and settled back to sleep. Hal cast his gaze over the tilled fields and green forests that lined the banks of the river. It was attractive country, he thought. “Did you ever raid in Araluen, Thorn?” he asked. “Facing one would be bad enough,” Hal agreed. Stig was sitting on a coil of rope several meters away, idly put­ting an edge on his already razor-sharp saxe knife as he listened to their conversation. “D’you think Gilan will be at Castle Araluen yet?” he asked. Originally, they had planned to leave Cresthaven Bay at the same time as the Ranger, who was riding overland back to the capital. But they’d had a long, hard voyage south to Socorro and Hal wanted the Heron in tip-top shape for her first appearance at Castle Araluen. There were some sections of running rigging that had frayed and needed splicing and repairing, and there was a large, splintered gash in one of the planks on the waterline, where they had nearly run aground pursuing Tursgud’s renegade ship Nightwolf through the shoals. It took half a day to plane that smooth and repaint the timber so there was no sign of the damage. In addition, Edvin wanted to replenish their stores and fresh food and suggested that they should do it at Cresthaven, where the village was contracted to supply their needs as part of the duty ship agreement. “No point spending our money elsewhere when they’ll provide it for nothing here,” Edvin had said, and Hal agreed. As a result, they sailed out of Cresthaven and headed north to the river mouth some two days after Gilan had ridden off, waving farewell as he topped the rise above the bay where they were moored. “Do you consider yourself a roughneck?” Thorn asked. “I may be. But you’re roughneck enough for all of us,” Hal told him and Thorn grinned contentedly. Farther forward, in the waist of the ship and with no responsi­bilities to attend to during this current long reach of the river, the twins were bickering, as they were wont to do. They had been silent for some time, much to the crew’s relief, but that was a situation too good to last. “You know that brown-eyed girl who was sitting on your lap at the welcome-home feast?” Ulf began. Ulf paused, smiling quietly to himself, preparing to throw out his verbal challenge. “Well, she fancied me,” he said. Of course, what made this discussion puzzling for the rest of the crew was that Ulf and Wulf were identical in every respect. “Well, she played it very well. You certainly didn’t get her,” his brother told him, with some heat in his voice. He had noticed Ulf admiring the girl early in the evening and had swooped, success­fully, before his brother could act. Lydia, who was leaning on the bulwark several meters away, groaned audibly as the exchange continued. “Devilish good looks? You’re as ugly as a mange-ridden mon­key,” Wulf told him. But his brother was already shaking his head. Of course, what made this discussion puzzling for the rest of the crew was that Ulf and Wulf were identical in every respect. For one of them to call the other ugly was for him to call himself ugly as well. But they never seemed to grasp that fact. As they continued speaking, their voices, at first lowered, rose in volume so that the entire crew could listen to their meaningless drivel. Hal decided that enough was enough. The massively built boy was sitting forward of the mast, lean­ing back against it, his long legs splayed out on the deck before him. He turned and peered back toward the steering position. The rules of the ship were that if the twins carried on one of their idiotic arguments at sea, Ingvar was within his rights to throw one of them overboard. In fact, some of the crew felt, he was obliged to throw one overboard. Usually, a reference to this fact was enough to stop the mindless discussions they enjoyed so much. His voice was distracted and flat. Lydia, a few meters away, noticed this and turned to look at him, frowning. Hal mirrored the expression. Usually Ingvar was good tempered and cheerful. Now he sounded listless and bored. Hal wondered if something was on the big boy’s mind. Ulf and Wulf fell instantly silent. These days, they were never quite sure how much rope Hal would give them before he ordered the huge Ingvar to toss one or the other, or even both, overboard. Discretion was the better part of valor in such a case. Hal noted that they had stopped arguing, and he nodded in Ingvar’s direction. But the young giant wasn’t looking his way any­more. He had resumed his seat against the mast, and Hal heard him give vent to a loud sigh. Hal looked at Stig, who was also watching Ingvar curiously. “Have you noticed Ingvar’s been acting strangely for the past few days?” Hal asked his first mate. Whatever it was that he had been wondering was forgotten as the ship swept past a high bluff. In the near distance, set among tailored and carefully tended parkland, stood the majestic, beauti­ful Castle Araluen, a mass of graceful spires, soaring turrets, flying buttresses and fluttering pennants. [dropcap]T[/dropcap]he castle stood on rising ground half a kilometer from the river. It was surrounded by an area of open ground. In the intervening space was a narrow belt of forest—naturally occurring trees of a darker, wilder green, rather than the carefully planted and positioned ones that surrounded the castle. The castle itself glittered golden in the sunlight. It was huge, but its size did nothing to diminish the grace and beauty of the building. Quite simply, it was like nothing the crew of the Heron had ever seen. They stood transfixed, staring at the castle with something approaching awe. “It’s amazing,” Stefan said quietly, and the others murmured agreement—all except Ingvar. “What is it? What are you all talking about?” he asked, the irritation obvious in his tone. Lydia turned to him and placed her hand on his arm in a gesture of apology. This was so unlike Ingvar—gentle, good-natured, helpful Ingvar. She stepped back in surprise as Ingvar shook her hand from his arm and scowled out in the direction of the castle. To him, it was nothing but a blur. In fact, he couldn’t even be sure that the blur he was he was looking at was the castle. For a moment, Lydia was too shocked to reply. This was so unlike Ingvar—gentle, good-natured, helpful Ingvar. She looked around uncertainly, to see if the others in the crew agreed with her. She caught Hal’s eye and the skirl shook his head in a warning gesture. He thought he was beginning to understand the reason for Ingvar’s recent depression. Lydia looked back at Ingvar, standing scowling out at the coun­tryside. With an effort, she made her voice light and friendly. “Of course. Forget I spoke,” she said. Ingvar snorted disdainfully. “If we must,” he said, and moved forward to stand alone by the covered shape of the Mangler. An awkward silence settled over the small craft, eventually bro­ken by Thorn. And he was right. Erak’s Hall was an impressive building by Hallasholm standards, but compared to this vision of wonder, it was little more than a log cabin. “And it’s drafty and smoky with it,” Edvin said. “But think of the cost of heating that . . . pile of masonry,” Thorn persisted. Hal smiled quietly to himself. Thorn’s interjection had taken the crew’s minds off the awkward scene between Ingvar and Lydia. It wasn’t the first time the old one-armed warrior had done some­thing like this. The young captain realized that he could learn a lot in man management from his shabby friend. “Well, you pay taxes to Erak,” Stig pointed out. Thorn gave him a withering look. “Not if I can avoid it,” he said in an undertone. The discussion could have continued indefinitely, but Stefan, standing on the bulwark for’ard of the mast, pointed to the bank. Hal assessed the position of the substantial wooden jetty, then glanced quickly at the wind telltale on top of the boom. They’d be heading directly into the wind as they steered toward the jetty. The crew hurried to obey his orders. Jesper and Edvin cast loose the sheets while the twins brought the mast and sail sliding down to the deck. The four of them quickly bundled the sail up and stowed mast and sail along the line of the ship. Then they hur­ried to their rowing positions, sliding their white oak oars out through the rowlocks. Stig and the others were already in position, Stefan having slipped down from the rail and dropped onto his rowing bench. Thorn and Lydia stood close by Hal at the steering platform. In­gvar, Hal noticed, remained in the bow, staring moodily across the river. The young captain shrugged. Ingvar usually didn’t take an oar for ordinary maneuvers. His massive strength tended to unbal­ance the thrust on the ship. “Ready?” called Stig, and the six oars rose slightly in preparation. “Stroke!” he called and the oars went back, then dipped into the placid surface of the river. As the rowers heaved on their oars, Hal felt the ship drive forward, and the tiller came alive in his hand. He swung the ship toward the jetty on the southern bank of the river. As Stefan had noted, there was a considerable crowd—perhaps fifty people—on the jetty and the riverbank beside it. A small group of three, presumably the official party, stood apart from the others. Two of them were clad in the now-familiar gray-and-green cloaks of the Ranger Corps. The third was far more lavishly dressed. Jewelry and decorations glittered on his doublet, catching the sunlight in a series of little flashes. “There’s Gilan,” Lydia said quietly, as one of the cloaked fig­ures stepped forward and raised a hand in greeting. Hal returned the gesture. As they glided closer to the jetty, Hal could make out the rich accoutrements on the third man’s doublet, and the fur trim on his red velvet-lined cloak. “Maybe it’s the King,” Thorn joked. Kloof, sensing the interest that they were showing, advanced to the bulwark and reared up on her hind legs, her massive forepaws on the railing. Kloof! she said. There were several dogs among the group on­shore and they quickly replied, in a chorus that ranged from high-pitched yips to deep-chested baying. As they had been talking, Hal had automatically been gauging the distance and angle to the jetty. He called now to the oarsmen. Stig and the others instantly stopped rowing and raised their oars to the vertical. Then, in one movement, they lowered them, dripping with river water, into the ship, stowing them along the line of the hull beneath the rowing benches. With the last of the way on her, Hal swung the little ship so that she came alongside. Jesper and Stefan took bow and stern lines and scrambled up onto the jetty, making the ship fast and hauling her in against the timber pilings so that the fenders on her side creaked. There was a momentary silence, then Gilan stepped forward. Hal and Thorn stepped up onto the jetty, followed by Stig and Lydia, then the other crew members. The Chamberlain was short and stout. As Hal had noted on the approach to the jetty, he was dressed rather flamboyantly, his red velvet doublet decorated with precious stones and chains. Anx­iously, Hal cast a quick glance over his shoulder to make sure Jesper was out of pickpocket reach. Then he shook hands. Lord Anthony’s grip was firm, but the hand was soft, not calloused and hardened like a warrior’s. Hal guessed he was the King’s administrator. He noted, however, that the man’s eyes were intelligent and observant, casting a quick, appraising glance over the assembled crewmen. “Thank you . . . Lord Anthony.” Hal stumbled over the title. He wasn’t sure how one addressed someone called “Lord.” But he seemed to have got it right. Anthony nodded and smiled, then stepped back. “I’ll return to the castle and make sure your rooms are ready for you,” he said. Hal gave a half nod, half bow, then the Chamberlain turned away, swirling his cloak around him as he did, and strode off the landing jetty to where his horse was tethered. “Anthony’s a bit stuffy, but he’s a good man,” Gilan told Hal. “Now come and meet Crowley, the Commandant of the Ranger Corps—and my boss,” he added, with a grin. The other Ranger was a little shorter than Gilan, and as he pushed back the hood of his cloak, Hal could see that his sandy hair and beard were liberally sprinkled with gray. His eyes were blue and had a mischievous light to them. Hal found that he in­stinctively liked the older man. Gracefully, he switched hands to shake hands with Thorn in his turn, doing it left-handed. Lydia flushed. She’d spent most of her early life alone in the forests hunting and she wasn’t good at social occasions. She shook hands with Crowley and mumbled something inarticulate along the lines of pleased to meet you. Crowley sensed her awkwardness and favored her with a friendly grin. “Don’t know what you’re doing with this rough crowd,” he said and she smiled in return. Crowley had a natural charm to him and he was expert at putting people at their ease. “I try to keep them in line,” she said and he released her hand, patting it with his free hand first. Crowley moved on as Hal introduced him to the rest of the crew. Hal was glad to see that Ingvar had joined them and seemed to be over his disconsolate mood. Crowley raised his eyebrows slightly at the size of the young giant but, perhaps wisely, didn’t comment. He raised his eyebrows even farther as they came to the twins. “And this is Ulf and Wulf,” Hal said. The twins looked crestfallen that he had seen through their ploy so easily. Hal grinned. It wasn’t often that someone got the better of the twins. Perhaps Gilan had warned his Commandant of the twins’ propensity to play practical jokes. He didn’t quite succeed in hiding his smile as he said it. Hal glanced quickly at Thorn before replying. 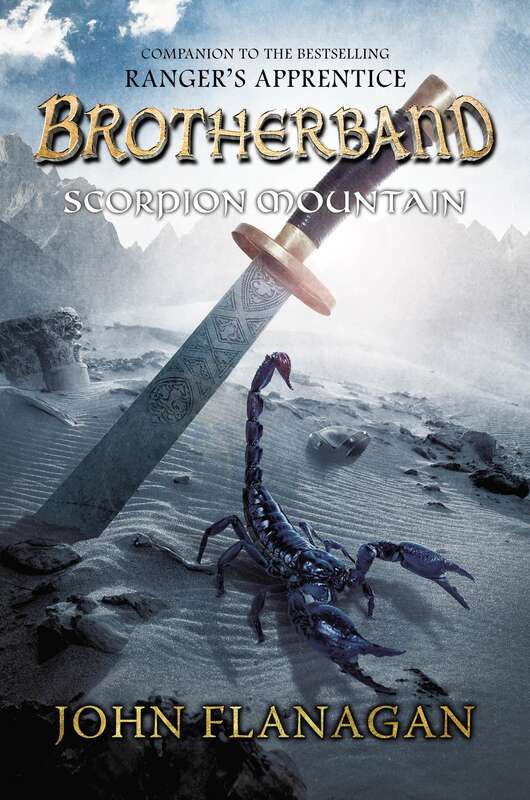 Scorpion Mountain (Brotherband Chronicles Book 5) Scorpion Mountain hits shelves Dec. 2. 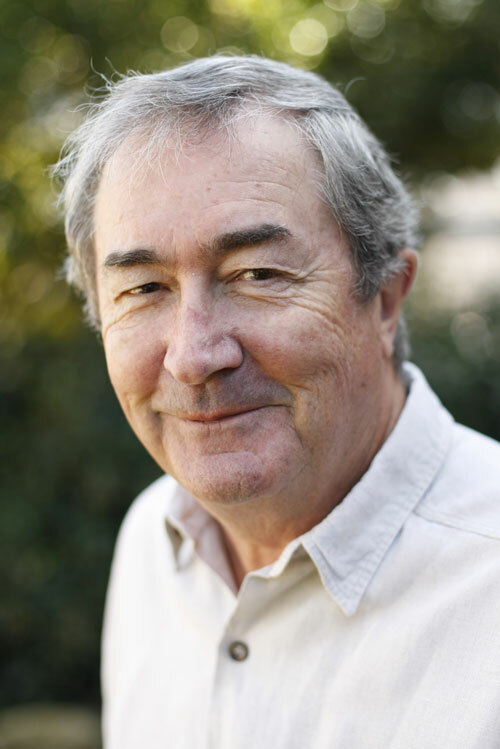 John Flanagan grew up in Sydney, Australia, hoping to be a writer, and after a successful career in advertising and television, he began writing a series of short stories for his son, Michael, to encourage him to read. Those stories would eventually become The Ruins of Gorlan, Book 1 of Ranger’s Apprentice, the international phenomenon that has sold millions of copies and made readers of kids the world over. Mr. Flanagan lives in the suburb of Manly, Australia, with his wife. In addition to their son, they have two grown daughters and four grandsons. Want to meet the author? He will be touring the country throughout December. Click here to see when John Flanagan will visiting a bookstore near you! This entry was posted in Fiction and tagged homepage on October 21, 2014 by Clay Swartz.